For those of us who find most white chocolate KitKats to be too sweet, Nestle Japan has an answer. 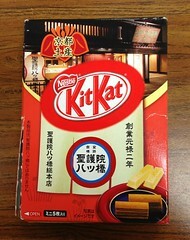 They have expanded their line of "adult sweetness" KitKats with a few more limited edition flavors. Recently, I've tried both Raspberry and Matcha, but as I like to save the best for last, I'll start with Raspberry. A friend of my sister's brought this back from Japan, and again, my sister was kind enough to share. This is mostly unrelated, but recently, I made white cake for my mother's birthday, and my husband made a raspberry filling from fresh raspberries. The filling was so good that we added too much, and when the cake was frosted, the filling came oozing out the sides like blood from a wound. So don't overfill your cakes, unless you were going for the bloody look anyway. The bar smelled of raspberry and butter, a bit like a fancy soap you might find in a guest bathroom. 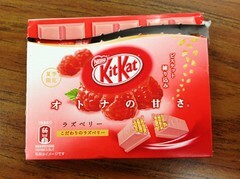 The raspberry flavor was tart and sharp, and the KitKat delivered on its promise of reduced sweetness. The white chocolate gave the bar a mild, milky flavor without adding the burning aftertaste of too much sugar. The wafers tasted a bit different, too, and according to the box, they've been refined. This gave the bar a slightly grittier, softer texture rather than the signature KitKat wafer crunch, but the texture was still enjoyable. 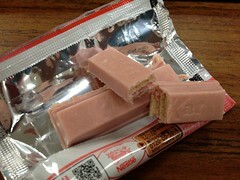 This was my first raspberry KitKat, so I don't know how it compares to the regular, non-adult version, but it was a nice change of pace from strawberry. Dear readers, you may recall that my boss visits her family in the United Kingdom once or twice a year, and she is so kind that she often brings me some chocolate back "in exchange" for watering her plants while she's away. I firmly insist that this arrangement is lopsided in my favor, but I very much appreciate the chocolate. Today, I'm reviewing two of the four bars pictured above, and the other two will be posted soon. 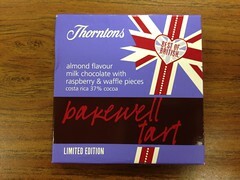 I started with the Bakewell Tart, because it just sounded delicious, and Sea Salt & Lemon, because the combination was new to me. 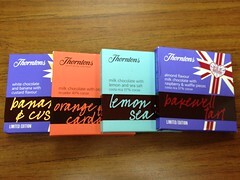 Both are milk chocolate bars, and they came very highly recommended by my boss and her husband. The packaging for this bar is adorable, and the description alone sounded delightful. It certainly delivered on aroma, smelling of milk and almonds. 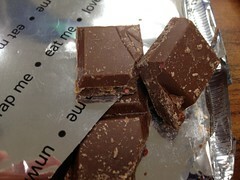 Although the bar got a bit damaged in transit, you can see the raspberry bits and waffle pieces embedded in the milk chocolate. The almond flavor was along the lines of amaretto, sweet and almost cherry-like, which was a perfect companion for the tarter raspberry pieces. 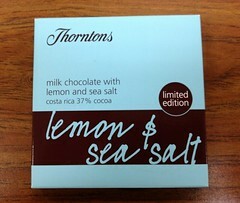 Lemon & Sea Salt fared a bit better in transit, which was great, because the design on the bar was very pretty. 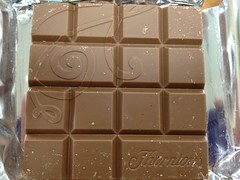 The snap of the bar was firm for milk chocolate, and there was a slight lemony aroma. The salt was sparse, but so good with the lemon. I never would have guessed (but I should have, as I love a salt rimmed margarita)! It was a bit sour, a bit salty, and wonderful. Has it really been 2 months? Well, my spring hiatus is over, and I've got a backlog of reviews to get through. Even when I don't post, I'm taking pictures and documenting about 75% of the candy I eat, so if you're still reading, thank you very much, and you can expect more posts this summer. The daughter of one of my sister's coworkers went to Japan for a school trip, and she bought some treats for my sister while she was there. My sweet sister was kind enough to share them with me, and I was especially excited to try the Kyoto edition Yatsuhashi KitKat. Yatsuhashi is a famous souvenir snack from Kyoto made of rice flour with cinnamon and sugar. 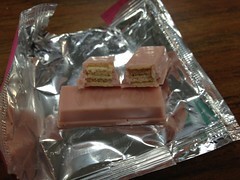 It comes in raw and baked forms, and this KitKat draws from the baked version. The bars smelled like cinnamon, but the first bite was intensely sweet. 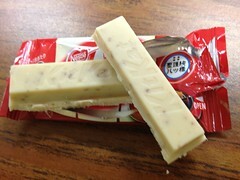 White chocolate KitKats are known to be overly sweet, but this one was intense. After getting past the sweetness, there was a strong, pleasant cinnamon flavor. Normally, the sweetness would put me off, but in this case, I was reminded of my favorite childhood cereal: Cinnamon Toast Crunch. It was uncanny. The little brown flecks in the chocolate that you see in the picture seem to be bits of crunchy yatsuhashi, which were firmer than the wafers, making for a nice variety of textures. 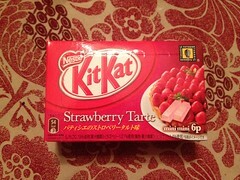 It was different from any other flavored KitKat I've tried, and with the white chocolate, I was also reminded of cinnamon ice cream. Sure, it was too sweet, but I'm cutting this one some slack for the nostalgia factor.